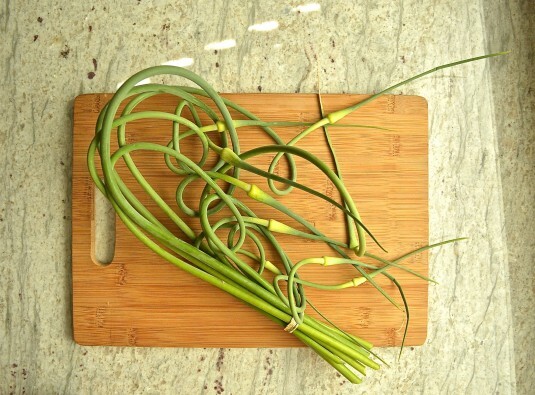 Well, how about treating the scapes more as an aromatic? 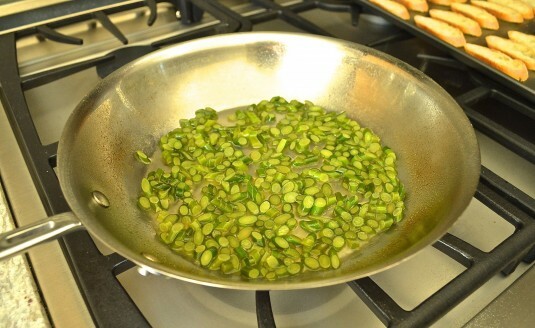 Sautéeing them in a little oil, then simmering in chicken stock helped to coax out a gentler, rounder flavor. So maybe this is the way to fully appreciate what garlic scapes have to offer. With simmering, the scapes took on an earthy, decidedly mellow quality that pairs wonderfully well with sautéed mushrooms. Adding a little lemon zest and juice helped to brighten the flavors, too. 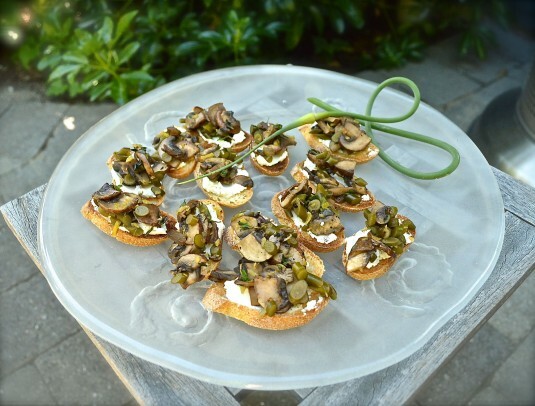 A thin layer of goat cheese on the crostini first, then the scape-mushroom mixture and in no time we had elegant, seasonal canapés — perfect with our gin and tonics on a hot summer night. I might not seek out garlic scapes at the farmers market, the next time they arrive in my CSA box I’ll know exactly what I’ll do with them. Cocktails, anyone? Adapted from a recipe from Saveur magazine for a Conserva of Spring Porcini, Fresh Ricotta and Braised Garlic Scapes. Preheat broiler to high. Place baguette slices on unlined baking sheet and toast until light brown (3-4 minutes). Turn over and toast the other side until light brown. Remove from oven and let cool. Heat oil in medium sauté pan over medium heat. Add scapes and mushrooms and cook, stirring often, for 2-3 minutes. Add up to 1 more tablespoon of oil to the pan if the mushrooms start to stick. Pour chicken stock into pan and increase heat to medium high. Season with salt and pepper. Bring mixture to a boil, then reduce heat to low and simmer for 10-12 minutes, stirring occasionally, until the scapes and mushrooms are tender and the excess stock has evaporated. Remove from heat and stir in lemon zest, lemon juice, and thyme. Taste for seasoning, and add more salt and/or pepper if desired. Let mixture cool slightly before serving. To serve, spread goat cheese evenly over the 24 slices of baguette (about 1 tablespoon per slice). Top each with a good spoonful of the scape-mushroom mixture, and place on a serving plate.